Integrating Communications, Assessment, and Tactics, or ICAT, is a use-of-force Training Guide designed to fill a critical gap in training police officers in how to respond to volatile situations in which subjects are behaving erratically and often dangerously but do not possess a firearm. The Training Guide includes model lesson plans and support materials (including Power Point presentations, videos, and other resources) in the key areas of decision-making, crisis recognition and response, tactical communications and negotiations, and operational safety tactics. ICAT then integrates these skills and provides opportunities to practice them through video case studies and scenario-based training exercises. Patrol officer response. In almost every situation where a subject is behaving erratically (often because of mental illness or behavioral crisis), it is a patrol officer—a “beat cop”—who is the first to respond. ICAT provides these officers with the skills and options needed to safely and effectively manage these encounters, especially in the critical first few moments after officers arrive. In many instances, the goal is for the first responding officers to buy enough time so that additional, specialized resources can get to the scene to support a safe and peaceful resolution. Non-firearms incidents. ICAT focuses on those critical incidents in which the subject is unarmed or armed with a weapon other than a firearm (such as a knife, baseball bat, rocks, or other blunt instrument). Unlike situations in which the subject has a firearm and officers have few options besides lethal force, these non-firearms incidents often present officers with time and opportunity to consider a range of responses. Helping officers safely and effectively manage these types of encounters is the focus of ICAT. Integration of crisis recognition/intervention, communications, and tactics. In recent years, a growing number of police agencies have been providing their officers with specialized training on how to interact with persons who are in crisis because of mental health issues or other factors. ICAT builds on those efforts by integrating communications and tactical skills with crisis intervention approaches. This integrated approach is presented in the context of a Critical Decision-Making Model that helps patrol officers develop and think through their options in these challenging non-firearms incidents. Officer safety and wellness. ICAT is centered on PERF’s Guiding Principle #1: “The sanctity of human life should be at the heart of everything an agency does.” The Training Guide focuses on protecting officers from both physical threats and emotional harm. This is accomplished by equipping officers with the tools, techniques and skills needed to slow down some situations and pursue options for safely resolving them. The goal is to help officers avoid reaching the point where their lives or the lives of others become endangered and the officers have no choice but to use lethal force. 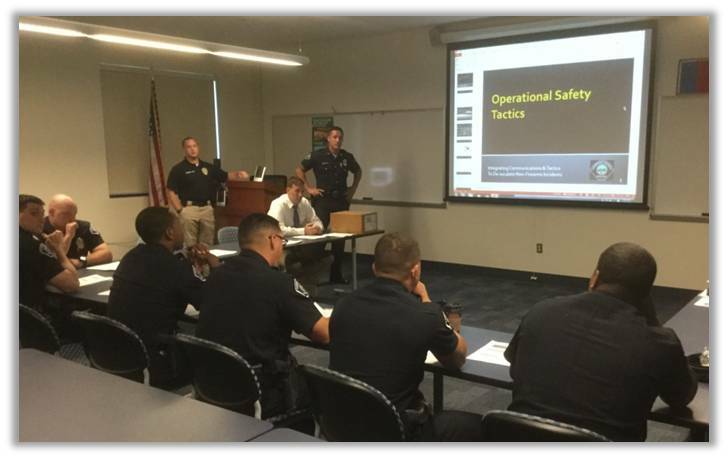 PERF encourages police agencies and academies to be creative in how they choose to use the ICAT Training Guide. Some may decide to present ICAT as a stand-alone training program, for recruit or in-service training, or both. Other agencies may choose to incorporate the ICAT training modules into existing programs on de-escalation, tactical communications or crisis intervention. Still other agencies may want to take elements of individual modules and create their own lesson plans that are tailored for their agencies and communities. And because many skills (such as tactical communications) are perishable and need to be reinforced and practiced on a regular basis, some agencies may choose to include elements of ICAT in their roll call or team training exercises. ICAT is designed to be flexible enough to accommodate these and other approaches. However, it is critical that whatever approach is used, the agency or academy focus on the integration of skills, and not present the material in training “silos.” This focus on integration is what makes ICAT unique.